Welcome Home! is a coalition of Nashvillians advocating for a comprehensive, inclusive, and adequately funded plan to address the urgent need for affordable housing in our city. They’ve created a comprehensive plan for affordable housing that aims to help keep current residents in their homes and welcome in their neighborhoods, and to support the development of attainable housing opportunities in our rapidly growing city. Read more about what they’re doing HERE, and sign on to join them! 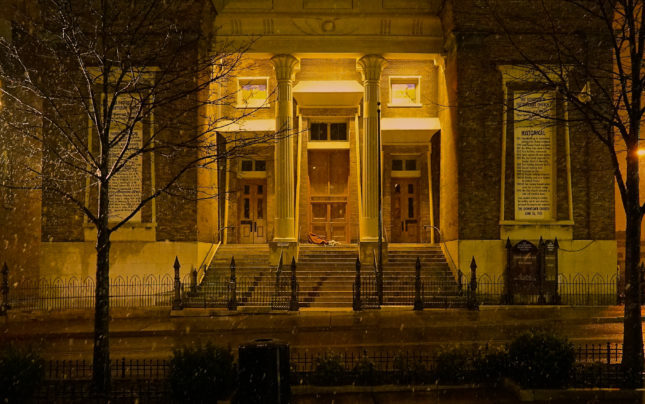 Official counts of Nashville’s homeless are given for one supposedly “average” night, but underestimate the annual count by an order of 10: there are likely over 23,000 people experiencing homelessness in Nashville, and more than 12,000 live in families. Full story in The Nashville Scene here. Petitions Delivered Open Table Nashville joined in the petition drive and march to support our friends on the street as they asked Mayor Barry for more affordable housing and an end to criminalization. Over 1300 signatures were collected. The Mayor said she recognizes more needs to be done, a comment echoed at her appearance at the NOAH forum at the end of the month, attended by more than 2,000. We are thankful that she has contributed more to the Barnes Fund for Affordable Housing than previous mayors, but at her pledge of $10 million per year, it is still insufficient to make up for losses of affordable housing in Nashville where apartments are sold off for quick remodels and higher rents monthly. NOAH suggested the number should be $40 million per year. The city contributed $10 million to the zoo for several consecutive years, and while we love animals too, we believe the city can do better for the 23,000 people experiencing homelessness in Nashville—a number that includes more than 8,000 children. Between 2011 and 2015, MNPD conducted 7.7 times more traffic stops annually than the U.S. national average. In 2014, this was 3.4 to 6.8 times the average of comparison cities across the SunBelt. At the same time, in comparison to these cities which make many fewer stops, Nashville trailed in violent crime rates, and was bested by two of them in property crime rates. 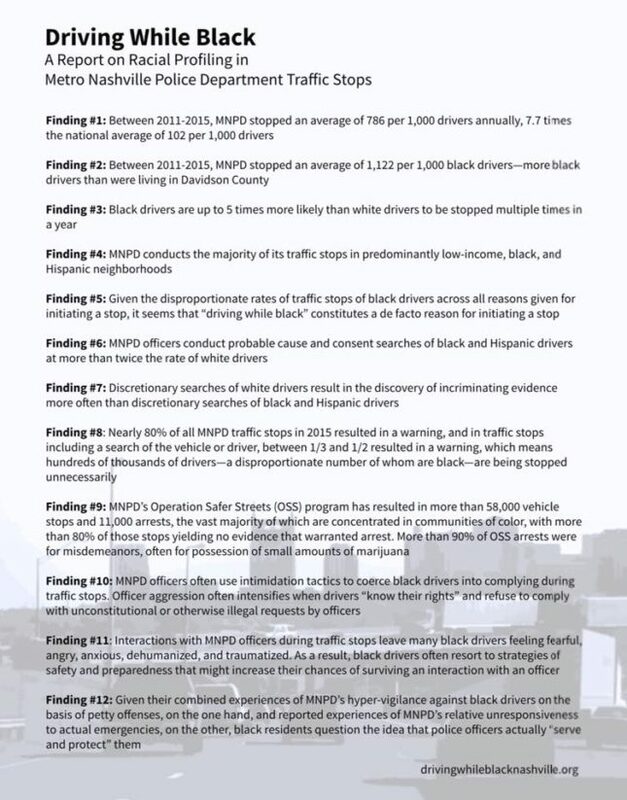 Between 2011 and 2015, MNPD made more stops of black people than there were black people 16 years and older living in Davidson County. MNPD consent searches are invasive and fail to yield incriminating evidence 88.4 percent of the time. Evidence of unlawful activity is found during searches of white drivers more often than in searches of black and Hispanic drivers. The report, which has resulted in calls for a Department of Justice investigation, can be found here. Open Table Nashville won the The Healing Trust Catalyst for Change Award this year. So thankful to the Healing Trust, and for all of you who joined us in making a difference. While we are thrilled to be honored, we have so much more to do! Nashville City Council passed bills incentivizing inclusionary zoning for workforce and affordable housing (BL-133 and BL-342). Open Table Nashville partnered with A Voice and NOAH to advocate for this as a first step, but we have much more to do. Workforce housing is aimed at those earning 60-120% of the median household income, in Nashville about $48,000 per year. 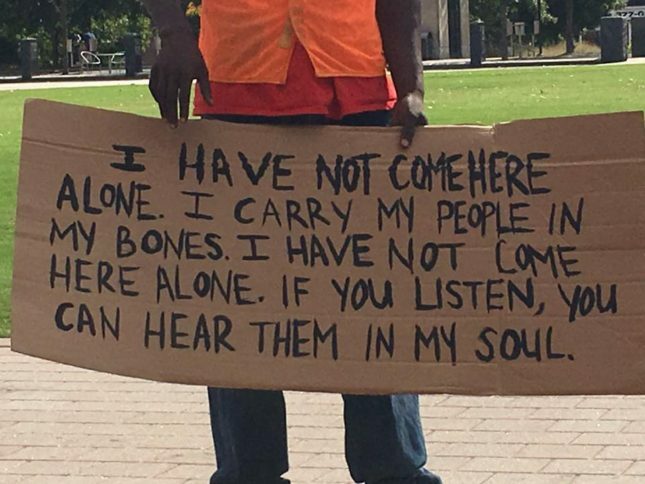 With half of Nashville workers making less than $29,000 per year, we need more affordable housing (for those making between 0-60% of median household income) to stop the pipeline producing homelessness as well as to provide housing to help get our friends off the street. Every month we hear of another apartment complex, once affordable, being sold off to a company that makes it unaffordable. We will continue to advocate for more affordable housing. Thank you, Tripp! Many of you know our dear friend and long time advocate, Tripp Hunt, who combines a law degree and a degree from Vanderbilt Divinity School. He has helped our friends find dignity and represented so many over the years. 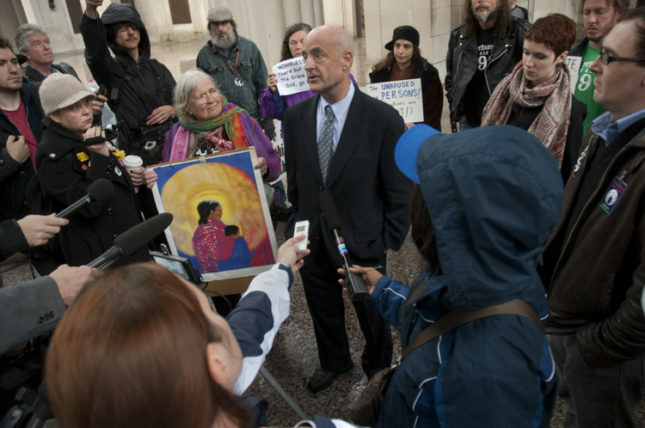 From fighting to defend the public speech rights of those at Occupy Nashville, creating a precedent for encampments and tiny homes at Green Street Church of Christ, or defending our friends from frivolous and unjust arrest, he has been there over and over for so many. Tripp is moving to be closer to his grandchildren, but will not be forgotten here in Nashville where he has made such a difference. We are so, so thankful for your compassion and advocacy, Tripp!